In the first part of this series, you will read about the YouTube generation, information overload, and what you can do to manage the incessant stream of information and stay focused and productive. In case you still had any doubt about it, YouTube has conquered the Internet, our lives and our time, in a matter of what seemed to be just a few years. At the same time, it has also given a whole new dimension to sharing information in general, and information about our deen in particular. Getting basic know-how or deeper knowledge about Islam has never been easier or faster. There are literally thousands of videos being uploaded every minute all around the world, from recorded lectures of well-known sheikhs, to enthusiastic individuals vlogging their two cents into cyberspace. In many ways, the abundance and accessibility of video lectures is positive, but could there be too much of a good thing? What do we actually do with all that information, and how does it affect our deeds and our productivity? We are encouraged, in both Qur’an and Hadith to seek knowledge and understanding, but with the rise of generation YouTube, we should be careful not to become mere mass consumers of information. It’s the benefit you and others derive from it and the deeds that affirm it, that really count. It’s an Information Jungle. Are You Overloaded? Memory: Maybe you notice that details often slip your mind. What was the hadith again that the sheikh mentioned? What was the point again that the brother or sister was making in the first part of the video? We all forget things, but information overload can make us especially prone to memory difficulties. Attention span and patience: You may find it difficult to focus or concentrate for longer periods of time. You could find that you switch off when the information is presented slower than you’re used to. It’s quick and easy to watch a couple of videos on YouTube about a topic that interests you, but after some time, you could discover that you can no longer bring up the attention to read a book about the same topic, or be patient enough to keep on looking and asking when information is not instantly available. Distraction and procrastination: There’s so much interesting stuff out there, and your thoughts flit from one thing to another. But projects and tasks are difficult to finish when you continue getting distracted. Procrastination is distraction’s nasty little brother. You delay working on what you should, and instead keep yourself busy with other things less relevant. Or it could be that you are simply so overloaded with information that you freeze and don’t know where to start to take action. Do you recognize some things? If you do, then maybe it’s time to take more control of the amount of information you take in, in order to stay focused and productive. Often, people don´t even realize how much information they consume, and this goes for YouTube as well. 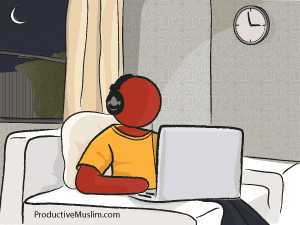 For one week, keep a record of all the Islamic videos you watch, including the topic and the time spent. Look at your list at the end of the week and ask yourself what you remember of the information and which videos you benefited most from, especially in terms of action taken. This should give you a good idea about where to start filtering. Now that you know where you benefit most from, use this knowledge to prioritize. Select the topics and speakers that really help you gain understanding and push you towards action. Prioritizing also includes putting the most essential branches of knowledge first. For example, do you know all the ins and outs of the appearance of the Dajjal, but you barely know enough Qur’an to make it through your five prayers? That should give you a hint about where to start. Sometimes you need to put a halt to the input. Take some time regularly to disconnect from the Internet and ponder and reflect upon the things you’ve heard and learned, and evaluate yourself. If you continue taking in new information, without pausing to digest, you won’t get all the nutrients out of it. In the second part of this series, you will read more about how to select video lectures and what you can do to bridge the productivity gap and maximize your benefit.